A debate has also come to have a meaning similar to an argument in the negative sense in colloquial English in modern usage. For example you may hear someone say, “The child had an all-out debate with his mother about not eating his peas.” In this less formal usage, the word ‘debate’ is used to show the discussion or disagreement was more involved or longer than a normal argument, or perhaps less emotional or passionately angry. ‘Debate’ carries the idea of more intellectual discussion about disagreement when used this way, as opposed to ‘argument’, which implies a more emotion driven quarrel. 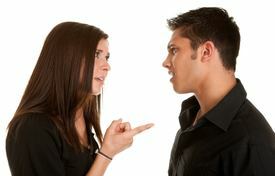 In general, ‘Argument’ means a line of reasoning or evidence in support of an issue or opinion. It has a more informal usage, as well as it can imply a personal dispute that has a more negative meaning to it. ‘Debate’ is more often used as a formal word that implies a larger or public-style discussion with people supporting both sides of the issue and rules or specific guidelines governing the proceedings. Aaron Hutchinson. "Difference between Argument and Debate." DifferenceBetween.net. June 8, 2016 < http://www.differencebetween.net/language/difference-between-argument-and-debate/ >.